ORLANDO and HONG KONG – Audiovisual and media development specialists ACE (Advanced Communication Equipment [Int’l] Co. Ltd.) and Technomedia Solutions LLC have formed a new strategic alliance to provide audiovisual and media production services to theme parks, museums, live shows, visitor attractions and other leisure and entertainment projects in China. Photo at top: Bingo Tso of ACE and John Miceli of Technomedia celebrate after signing their strategic cooperative agreement in February 2018. Photo courtesy ACE. ACE provided engineering and technical services as well as audio and lighting systems for the Impression Putuo live outdoor spectacular in Zhoushan, China. Photo: ACE. Technomedia Solutions has served the attractions industry for many years from Orlando and Los Angeles as a provider of AV and interactive media development as well as technology design and integration services. ACE, headquartered in Hong Kong, is one of China’s largest system integration firms, and also the country’s sole distributor of Harman audio products. ACE maintains additional facilities in seven mainland China cities. The alliance was formalized on February 2, 2018 in Beijing. 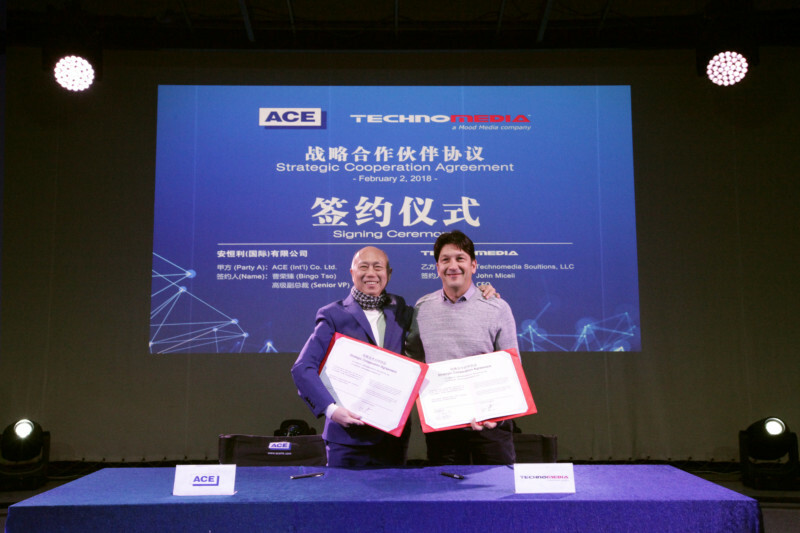 Bingo Tso, Chief Technology Officer and Senior Vice President of ACE, and John Miceli, President and Chief Creative Officer of Technomedia, closed the deal in a formal signing ceremony. When the firms co-bid on projects in China, Technomedia will address the creative aspects, and ACE will address the build, install and maintenance. The projection mapped ceiling of The Grand Hall Experience at Union Station, a Technomedia project. Courtesy Technomedia. ACE is a leading high-end audio-visual lighting system solutions provider creating products for theme parks, world’s fairs, convention centers, theaters and more. With more than 700 employees, ACE provides the conception, construction and maintenance for projects. Recent endeavors by the Hong Kong-based company have included Shanghai Disneyland, Wanda Theme Park and The Voice of China. Visit www.acehk.com. Technomedia Solutions LLC, based in Orlando and Los Angeles, is a premier provider of advanced audiovisual and interactive media development, technology design, and integration services to a variety of industries including retail, theme park, museum, restaurant, corporate, military, theatrical, special venue, corporate and educational markets. It is a subsidiary of Mood Media. Visit www.gotechnomedia.com. The Enigma Group is a global agency and consultant specializing in the attractions, entertainment, sports, hospitality, leisure, recreation, gaming and retail industries. Enigma is headquartered in Austin, Texas, with offices in China and the United Arab Emirates. Visit www.teamenigma.com.